I have been having a major moment with casual outfits lately. I recently got this dress from Amour Vert and not surprisingly, I adored it for its stripes. 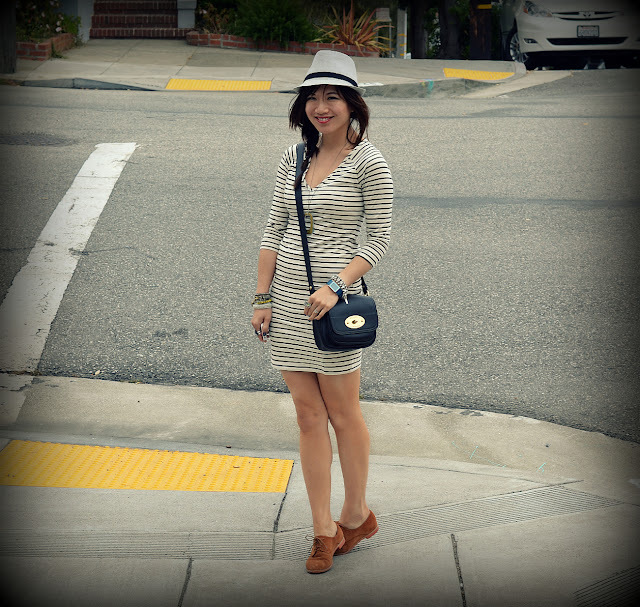 I kept up the casual vibe with this dress by pairing it with my neutral brogues and hat. I easily see this transitioning in the winter by wearing colored tights, a parka and a knit hat (though with our weird SF summers, I could easily do this now). love the dress. you look adorable! thanks for ur comment!! Love dress!!! Love this striped dress, you look so cute! Love the stripes!! This dress is so cute, and I love the shoes! Really cute outfit! I love LOVE that bag, we SERIOUSLY need a Target here in Ottawa! love your dress + bag!! OMG, Nancy. I don't know how you're wearing this in SF right now. It's freezing up there. I do adore the stripes on this dress and the casual brogues too. Come check out my blog to see what I've been wearing lately...and in San Fran. Your striped dress is so adorable! And that bag is a total steal - I can't believe it's from Target, it looks so high end! Great find! I've been wearing a lot of dresses recently because it has been so hot in Chicago! Love the striped dress with the hat. You have a very cool style, love your outfit..you look great! now following, hope you follow back! such a classic chic little get up! love the shoes and hat with that dress. so very you! This is such a laid back and chic look! Love the stripes and the hat.. you look fabulous! What a great dress. I have a severe obsession with anything striped. I love it with the hat too. Very casual chic. such a perfect summer look that is casual & glamorous! i hope you're having a fabulous week! This is a great casual look – love the stripes paired with oxfords and a hat. Also, that iphone case is so cute! You look great in our Amour Vert organic cotton Cassy dress! 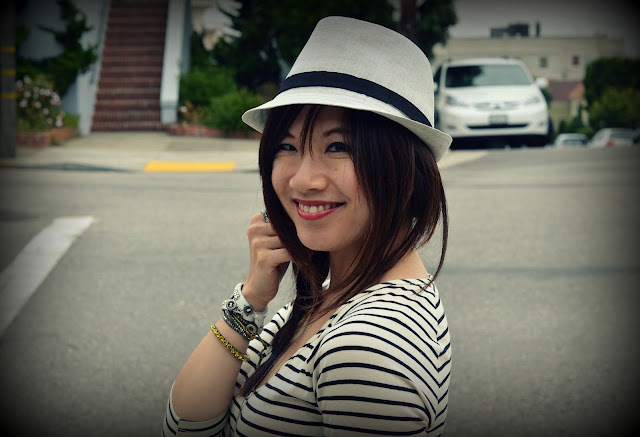 STRIPES + HAT = SO PARISIAN CHIC!